Having a pool is certainly a great way to spend family time during the warm summer months, but careful planning needs to go into successfully building and maintaining one. If you are considering the prospect of building a home, there are certain financial components that you need to account for in order to not feel the pinch in other areas. Consider the following four ways designed to help you fund your family budget while building a pool. Many people look at a heater as being a great component to their family swimming pool. This does, after all, allow for the pool to be used for more months out of the year. Many might feel that this give mores value to the prospect of having a pool in the first place, but is it necessary? You might very well discover that you do not need a heater after all. The recommendation here is to hold for a season or two and determine if it will actually be useful to you and your family. You can always go back and add one in later. A budget killer is the size of the pool itself. Do not go gangbusters here. Consider the size of your yard. You don’t want it all taken up with the pool, nor do you necessarily need a huge pool to begin with. Consider your budget and your family needs before making a final determination. Children do not really care about the size of the pool; they are just happy to have one at all. You are not finished when the pool is built. You will need to make room in your family budget for pool maintenance. Some companies, like KrisCo Aquatech Pool & Spas, know that you can learn how to do some of this yourself. For other components, you will want to get a quality and reliable service at a great price. Make sure you shop around for the plan that best fits your needs and budget. You might not know if you want a slide or water feature when you set out to build the pool. That is ok.
At the very least, plumb for it now. The expense is minimal and then you can go back at a later date and easily add these features in without having to dig up large sections of the pool. These are four ways to begin to fund your budget now. 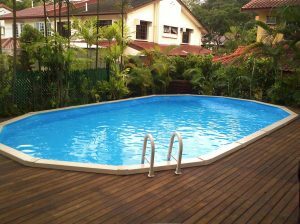 Think of how much enjoyment you will get out of the pool when it is finished. At the same time, do not sacrifice your financial stability and you will sleep much better at night. I live in upstate Ny where the winters are brutal. I am about to replace another above ground 24 round pool for the fourth time.My question is I do all the right measures when closing my pool but windy weather seems to do severe damage to the pool causing a liner leak which then pool will collapse before spring from lost water. Why are these winter winds causing such damage and what can I do differently o next purchase to prevent recurrent issues.